This recipe has everything that you would want in a fun appetizer or starter. Protein… check. Veggies… check. Booze… check. Perfectly cooked shrimp, fresh cucumbers, celery, avocados, tomatoes and onions sit in a martini glass and is kicked up with a spicy Bloody Mary. It’s like a ceviche or shrimp cocktail taken to the next level. This will definitely be served at our next party – it’s cold, refreshing and has a spicy bite. It’s perfect on a warm summer day. Make sure to dice the celery, avocado and cucumbers the same size. We had left over frozen shrimp from the Asian Shrimp and Edamame Salad and pretty much everything else on hand except for Smart and Final’s First Street tomato juice, which we bought at our local Smart and Final. You can assemble the two different parts: Shrimp and Bloody Mary ahead of time and store in an air tight container in the fridge until you’re ready to serve. It will keep for a couple of days. The veggies won’t look as bright and colorful as the first day, but if you’re pressed for time or if you’re just making this for yourself then this is an option to slowly devour the whole thing. Cook shrimp in salted boiling water for 1 minute. Drain shrimp and place shrimp in a bowl over ice to allow to cool. Once shrimp has cooled, add sea salt and lemon juice. Mix and let marinade as you prepare the other ingredients. Place onions, avocado, cucumbers, celery and tomato in a medium bowl. Gently combine. Add shrimp and gently combine, careful to not break up the avocado. Divide the mixture into 4 equal portions in martini glasses or small bowl. Mix all of the ingredients for the Blood Mary and place in a shaker with ice. 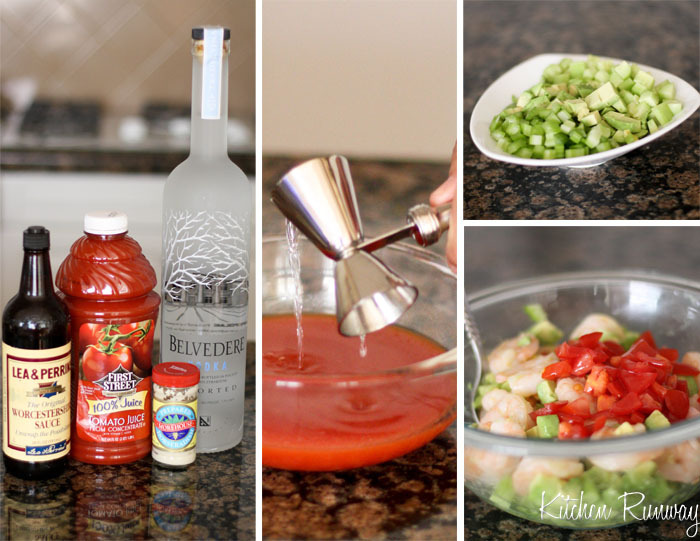 Vigorously shake and pour Blood Mary over the shrimp mixture. Serve cold. Garnish with a celery stick if you like. You will probably have left over Blood Mary – pull out a glass for yourself and stick a celery stick in it and drink! If you’re unfamiliar with Smart & Final’s First Street brand…now is the time to give it a try. Smart & Final is running a giveaway on their Facebook page to win a bag filled with First Street products (valued at $50) and a $50 Smart & Final gift card! There are five winners each week for four weeks. Good Luck! This has been a compensated post as part of a social shopper insights study for Collective Bias, all opinions are my own. 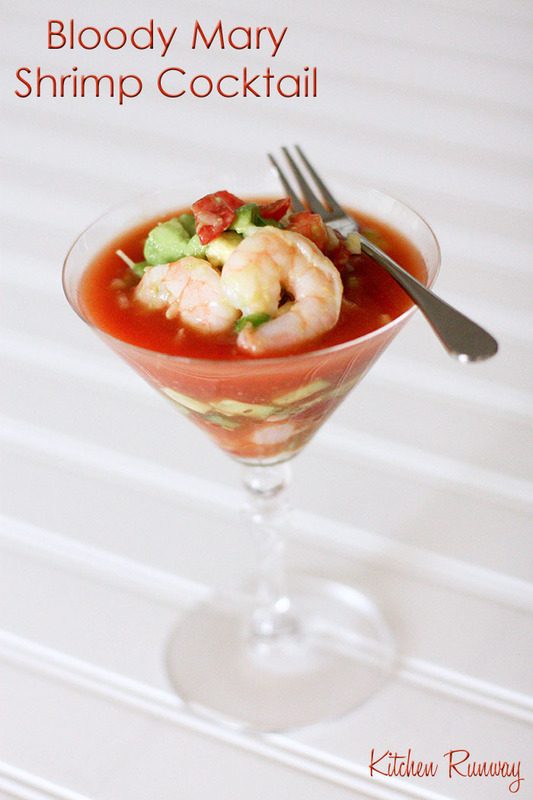 This entry was posted in Appetizers, Easy, Entertaining and tagged avocado, cocktail, Easy, healthy, lemon, shrimp, tomato. Best appetizer ever…low calorie, healthy, sublimely tasty…I’m looooving it! This is such an elegant dish, and I love that it doesn’t require a lot of time or effort! Amy @Dealusional: Thank you!! We love that it’s effortless too! I was looking for something to bring to my book club this Friday. I have found it! This looks fantastic! Ate a version of this in Texas. Ate a version of this in Maui. Now I’ll eat this ALL the time!